Following on from my last post about the Kachamba Brothers, I decided to try and find out more. First of all, I found some interesting photographs of Donald and ‘friends’ jamming together. These pictures were taken by Rike and Henrik Bettermann when they visited Chileka in Malawi as part of their 1996/97 tour of West and South Africa. One of the pictures is the same as the babatoni picture in an earlier post about babatoni – the kwela bass. 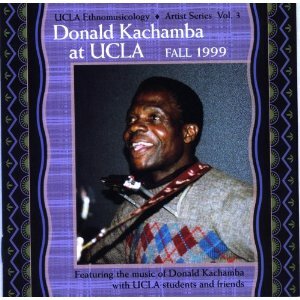 A linked page contains a biography for Donald Kachamba, and notes that he died on 12 January 2001. Shortly before Donald died, he was an artist-in-residence (November 1999 until July 2000) at UCLA’s Department of Ethnomusicology. Christie Burns (a.k.a Dulcimergirl) was one of the students that worked with Donald during this time, and she presents some of her memories, and a great recording of the students and Donald together, in her music blog. You can get hold of the UCLA course material through the Kwela Project Store; a song/essays book, and a CD recording (including the tune in Christie’s blog). I’ll review my copies here, just as soon as they arrive from Amazon.